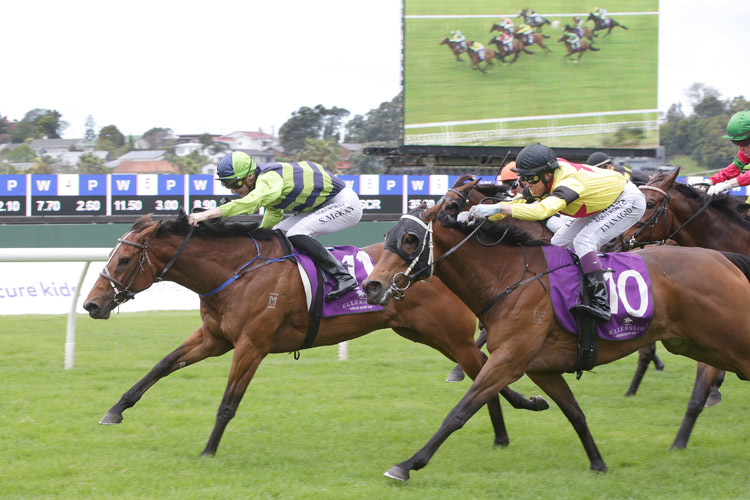 A win by talented mare Yearn over 1400m at Ellerslie on Saturday provided the perfect gift for trainer Karen Fursdon who was celebrating her 34th wedding anniversary on the day. “Kevin and I got married 34 years ago on Cox Plate day, the day that Red Anchor won,” Fursdon said. Somewhat of an Ellerslie specialist, with the win the mare’s third from six starts at the venue, Yearn displayed all of her grit and toughness as she staved off a host of challenges in the home straight after racing in a forward position throughout. “We probably went against her normal pattern by riding her so handy but nothing had been running on all day,” Fursdon said. “She goes best when she can find her feet early but we rolled the dice and it paid off. “She had been desperately unlucky at her last start as the saddle slipped twice so you can excuse that run. Fursdon believes there is a big race victory in the mare’s future so will sit down with owner Mark Lupton to work out a programme over the coming months. “As long as she comes through the race well we can start to look at her options now,” she said. “She is a valuable mare, being by Savabeel from a nice family, so the priority will be to enhance that value with some black type. “I think she is capable of getting a mile if there is a true pace and she can relax so there are some nice options around.